Mix and layer materials used for surfaces at home to create dramatic, beautiful spaces - this kitchen features High Pressure Laminate on tabletop and cabinets, as well as Solid Surface and Quartz on countertops, island and backsplashes. When it comes to mixing materials, there's no rule book; all you should do is find a combination to match your personality. (BPT) - The housing world is buzzing about the next transformative trend in home design and remodeling. This year it seems certain the growing trend of mixing and layering materials, something many designers and architects noticed was growing in popularity over the past few years, will dominate the remodeling and design scene. When it comes to mixing materials, there’s no rule book; all you should do is find a combination to match your personality. This might be one of the biggest reasons why people have taken to mixing materials, as it truly allows you to create a home that is uniquely yours. For those who have uncompromising taste, but are on a budget, mixing materials is the ideal solution. For instance, say you had your heart set on a marble island and surrounding countertops, but just can’t afford marble. Instead, you can choose from a variety of Wilsonart(R) Quartz for the island. Engineered to showcase the erratic veins and patterns prized in marble, quartz also has the advantage of being non-porous, so it won’t stain and requires virtually no maintenance. A timeless look that continues to win the popularity contest are nature's neutrals in white, grey and black, offering flexibility to play with bold or demure colorful accents. 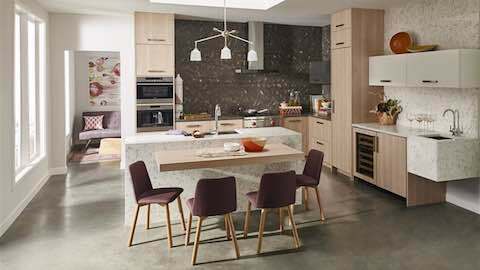 You can complement the quartz island by mixing in an even more affordable material like Wilsonart(R) Laminate for the perimeter countertops and vertical applications such as backsplashes and walls. With numerous styles to choose from, you’ll be able to create a stunning contrast and dimensionality that will make your room pop. With today's innovation in laminate manufacturing and fabrication, adding affordable luxury to your kitchen or bath has never been easier. Parents, in particular, face a constant dilemma: They want a home with rooms that can stand up to all the abuse toddlers and teenagers can throw at it, but still have it look good. The answer lies in Wilsonart(R) Solid Surface. This material is tough, non-porous, seamless and repairable without sacrificing beauty. With a wide variety of styles replicating stone, you can easily mix it with other material looks to make an intriguing statement. To explore hundreds of options, visit www.wilsonart.com and start mixing materials to see what’s possible in your home. Home & Garden: "The Home Design Trend to Know About"